Members of the Shoelaces for Teachers campaign are collecting shoelaces in honor of educators who work hard every day to help students to have a better future. These teachers understand the true meaning of education and put the needs of students ahead of politics and savory sound-bites. However, teachers could not succeed if not for the support of the community. Therefore, shoelaces are also being collected in honor of people who are speaking up on behalf of education-people who demand that teachers receive the support needed to do their job and who insist that public education remains adequately funded and available to all. They also understand that, while some aspects of education (such as creativity, independent thinking, engagement and compassion) cannot be easily measured, they represent some of education’s greatest achievements. When combined, all of these shoelaces become a “virtual march” in the name of education. The string of collected shoelaces will be measured and revealed during the world premiere broadcast of the documentary "I Just Keep Going" on July 30, 2010 on Ustreamtv. The stories of several of our honored teachers and supporters will be featured as part of this documentary. We would be honored to include a shoelace representing you and your ongoing efforts in our campaign. We would also encourage you to submit other shoelaces on behalf of other educators who have made a difference in the lives of students or who have worked hard to improve our educational system. We encourage you to write your name on the shoelace you submit (or on an enclosed piece of paper). We also would ask that you submit the name of other people being honored, should you submit additional laces. Shoelaces may be old, new, plain, or creatively decorated. That part is entirely up to you! Shoelaces should be mailed to: Laurie Murphy, 6414 Foster Road, Sebring, FL 33875. The Shoelaces for Teachers Campaign is sponsored by the SOS Million Teacher March, an organization made of up teachers, parents, students, and other concerned citizens who are rallying together in support of education. To learn more about the Shoelaces for Teachers Campaign or the SOS Million Teacher March, please visit us at www.sosmtm.com. Linda Burkhardt's handout "Key Concepts for Using AAC for Children who have Complex Communication Needs" is a valuable resource in our classrooms but often times it is difficult to explain to support staff, general educators, typical peers and/or administrators what it looks like to carry out those key concepts from day to day. One key concept that is often overlooked is that AAC should always be available, 100% of the time, no exceptions, (just last week our eyegaze device user had a clear plastic bag over her device with a cut out for the cameras so she could paper mache and communicate! Not my idea, but a brilliant one!). students without speech may not have a means to engage in self-talk, thus setting up an AAC device, even a sequential voice output switch during a "down time" at a low volume becomes an opportunity for self talk; the switch can say, "I am resting on this mat. It is cool and quiet in this room. Nice soft music is playing. My break will be over at noon." or it could be used as a means of self cueing (something we all do with internal self talk) and say, "I am feeding myself my lunch. I am scooping my yogurt with my spoon. If my chin feels wet I can wipe it with a napkin. If I need help I can press my help switch." or even during "freshing up" (as we call it) "I can getting freshened up. Soon I will be clean and dry. Then I will head over to circle time with my friends!" increased communication skills invariably lead to a decrease in negative behavior, thus a student who is moaning or yelling for attention who is offered a series of sassy messages can be reinforced to learn that those messages get more attention than moaning or yelling and a student who shuts down in order to get a break can be given a way to communicate, "I need some space" and taught to state that through others respecting that comment and thus the student may shut down less - All Behavior Is Communication! For nearly 2 weeks I have not have any internet access at home (at a coffee shop right now) . Silly AT&T! Hence the lack of posts, add in the end of the school year craziness and so forth and I haven't had a chance to get much done other than IEPs, progress reports, curriculum planning and AT/AAC work. Expect more soon when things get back to normal! This afternoon, leafing through a Mayer-Johnson catalog I saw an idea I posted about on September 7, 2007. They say imitation is the most sincere form of flattery. 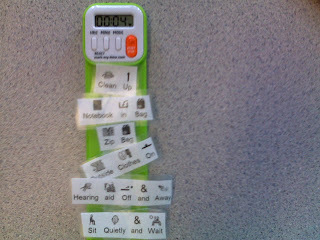 The idea was to use the "Mark-My-Time" bookmark as a visual schedule. In 2007 I had a student who was in need of working on his independence and time management skills as he prepared to leave for the day and using the "Mark-My-Time" bookmark as a visual schedule was just what we needed. Since then I have used the bookmark/timer adapted with some self-adhesive velcro for not only visual schedules but also for a token holder/star chart for students collecting tokens/star during differential reinforcement of zero rates of behavior or differential reinforcementb of incompatible behaviors. It seems Mayer-Johnson and Turning Point Technology are both carrying the adapted Mark-my-Time bookmarks created by Augmentative Resources. Of course the Mark-My-Time Book mark retails at $8.44 on Amazon.com (and you can find it for as low as $6.70) and the adapted version will cost you up to $30.00. Then again, the original bookmark from Amazon and some self-adhesive velcro strips or a glue gun and some velcro receptive fabric should create the $18.00 version of the adapted bookmark/timer for less than $10.00. Which saves you enough to by two Mark-My-Time bookmarks at the unadapted price! In Massachusetts? Support the Wings of Hope School in Haiti! If you are not in Massachusetts please read anyway as there is an option for you as well! Assabet Valley Collaborative, a public educational agency which provides services to children and young adults with disabilities, including severe or multiple disabilities is supporting the Wings of Hope School, a school for children with significant disabilities in Haiti. Donations accepted at the door, 100% of proceeds benefit the Wings of Hope School. Intensive Sped Resources is a wiki I started a couple of years ago, yet it never really blossomed until recently. Lately it has had plenty of new members and I am hoping some folks will be interested in uploading Switch It Maker and Choose It Maker Activities, as well as Power Points for those with severe/profound special needs. Check it out! This past week our class decorated some wooden card holders we had recently acquired. We gathered up all our craft materials, with help from the students, especially those with "will gather needed items..." benchmarks on their IEPs and set to work. As you all know crafting in our classrooms is unlike crafting anywhere else. While it is a motor skills activity for some of our students, be it directly completing steps in finishing the craft independently, participating with visual/verbal cues or using hand-over-hand or hand-under-hand assistance or using a switch adapted tool like battery operated scissors or a fan and an a Powerlink to dry paint; crafting is often times much more a communication activity. That too occurs at many different levels, from pointing with a finger or using eye gaze to make choices from objects in a field of two or pressing a sequential step to play a message about the craft to use of middle level AAC like a communication book or static display device to use of a high technology device with dynamic display. Finally our class is just starting to work out how to best have each student tell about his or her product and the process of making it, some ways to do this are sequential switch, creating a document using Clicker5, Classroom Suite or Boardmaker Plus, using communication symbols/boards with core vocabulary and fringe vocabulary, using mid to high tech AAC with core vocabulary and related fringe vocabulary or something else. How do other people do this so as to have every student share his or her product at the highest level of self-generated language possible for each individual? This student picked brown,3 googly eyes, a red felt star and to write, "play cards" in orange and yellow using craft foam letters. Choices were made using a combination of a high technology AAC device with direct selection and pointing to objects. This crafter choose a silver background by picking the paint bottle out of the basket and then choose the googly eyes by picking them up as well. This student always has the most googly eyes possible on every project! This student made the card holder white with shiny colored flowers; choices were made using eye gaze to objects and a sequential switch. As you can see, no matter how communication happened the card holders turned out fantastic!